NASA and General Motors have come together to develop the next generation dexterous humanoid robot. The robots – called Robonaut2 – were designed to use the same tools as humans, which allows them to work safely side-by-side humans on Earth and in space. American astronauts may not return to the moon anytimesoon, but robotic explorers seem poised to go there — and just about everywhereelse — in the solar system in short order. NASA's new space exploration plan includes a heavyemphasis on robotic missions that would landon the moon, Mars and even asteroids to pave the way for human exploration. The agency?s 2011 budget proposed by President BarackObama calls for funding two such missions starting next year. One of thosemissions is a lunar expedition that would test the ability to control robotsremotely from Earth, or the International Space Station, on the moon. The next wave of robotic missions could also testtechnologies for mining or extractingwater, rocket propellant and other resources, according to the NASA budgetproposal. "Trying to do mining operations autonomously in aremote location and under extremely difficult conditions represents a huge challenge,"said Gerald Sanders, manager of NASA's In-Situ Resource Utilization Project. "But we're up to the task." Besides, the U.S. space agency won't go it alone if itsnew budget gets final approval. It has already recruited allies and expertisefrom private industry to help kick-start its robotic revolution. Coincidentally or not, NASA chose an aerospace engineer witha strong robotics background as its newtechnology guru. Robert Braun spent much of his career working orconsulting on Mars lander, orbiter and rover missions before eventuallybecoming the space agency's chief technologist. "The area where NASA could perhaps lead — an areawhich could affect society greatly — is robotics," Braun said. "NASAis doing amazing things in both robotics and human exploration assisted by allkinds of autonomous systems." 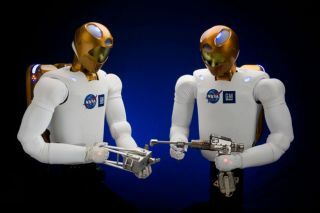 NASA has also emphasized more cooperation with privatecompanies for developing the next generation of robot explorers. It teamed upwith General Motors (GM) to unveil Robonaut 2, a humanoid robot that can useits hands to manipulate tools. Such a robot could work with minimal humansupervision on the International Space Station. Private industry has also been developing space robotsbased on its own initiatives, such as the $30 million Google Lunar X Prize thatchallenges teams to land and operate robots on the moon. Many contenders mighteventually go into business flying lunar robotic missions for $50 million or$60 million, according to Peter Diamandis, chairman and CEO of the X PrizeFoundation. "The goal here is to develop a low cost, reliable, turnkeyexploration system where NASA can purchase the ability to fly to the moon witha lander, hopper or rover on a regular basis," Diamandis told SPACE.com. Space-inspired robotic projects could lead to plenty ofEarth spinoffs. GM noted that Robonaut2's technological advances could spawn better robots for building cars onthe assembly line, as well as better vehicle safety systems. Similarly, a diamond-embedded drill designed by NASA andCanada's Northern Center for Advanced Technology for piercing lunar regolithand ice eventually led to a sidewall dry-drilling spinoff on Earth. Still, Earth-bound technology has also provided plenty oflessons for developing space robots that can operate in alien environments. Sanderspointed out that NASA's Johnson Space Center (JSC) has spent years hashing outlunar robot designs with Caterpillar, a leading manufacturer of constructionand mining equipment. "Caterpillar is working here with folks on roboticsystems for autonomous area clearing," Sanders said, referring to the In-SituResource Utilization Project at JSC. He added that the U.S. space agency regularly swapped ideas with mining companies at conferences such as an eventhosted by the Space Resources Roundtable. NASA will need all the knowledge it can glean from suchcooperative efforts. Extracting resourcesfrom Earth's moon still holds many uncertainties for how would-be roboticminers and should tackle the job. Much of the previous focus with NASA's cancelledConstellation program was on extracting oxygen from the lunar regolith. Now thespace agency's new direction coincides with a renewed interest in mining waterfrom the lunar poles, spurred on by recent water-ice discoveries made byorbiters such as Chandrayaan-1. Lunar probes such as NASA's LCROSS have recently gained abetter sense of the different moonwater ice flavors and forms. Lab tests on Earth have also revealed how anicy mixture of lunar regolith simulant can vary in consistency from sandygrains to very hard sandstone — different conditions that a robotic miner mightneed to handle. And that's just the moon. If approved, a second robotic mission might also aim toland on an asteroid or Mars. Its stated goal would include transformingmaterials into fuel and eventually helping human astronauts to "live offthe land," one step at a time, NASA officials said.